Two people are being sought after a U-Haul van slammed into parked vehicles overnight. 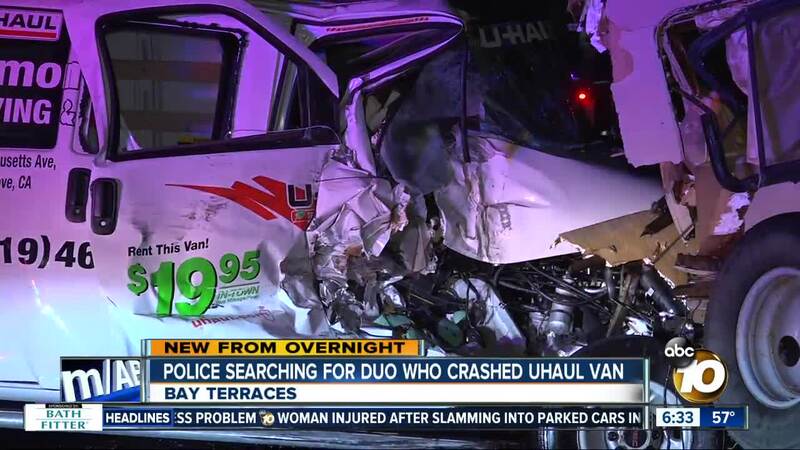 SAN DIEGO (KGTV) - A U-Haul van crashed into a parked RV and other parked vehicles in Bay Terraces late Monday night, and police said two people fled from the van and have not been seen since. San Diego police said officers responded to reports of a vehicle crash in the 300 block of Meadowbrook Drive at around 11:15 p.m.
Officers arrived to find a badly-damaged U-Haul van abandoned after it reportedly struck an RV and other vehicles parked on the street. According to police, officers followed a trail of blood coming from the wreckage but could not locate the van's two occupants, who are believed to be a man and a woman. Blood was also found on airbags that deployed inside the van. The crash is the second in less than 24 hours involving a U-Haul vehicle. Earlier in the day, a U-Haul moving truck crashed into the front of a county health services building in Kearny Mesa. The driver in that incident fled the scene, and police are looking into the possibility that crash was intentional.